US electric car maker Tesla has set up a 50-stall charging station in Hong Kong, the biggest of its kind in Asia, as it seeks to expand its presence in the city despite a drastic drop in sales caused when the government scrapped a generous tax break. The firm said it hoped officials would use the next budget, to be announced early next year, to continue “to take the lead to develop its clean energy goals”. So far the government has made no new commitments about the promotion of zero-emission electric vehicles (EVs). The message was made as the EV giant, led by billionaire entrepreneur Elon Musk, announced on Monday the opening of a charging station at FT Life Tower in Kowloon Bay, the largest public Tesla charging site in Asia. In a partnership with the building’s landlord, who also owns a Tesla limousine, the two-floor car park, with a total area of 4,564 square metres, is now installed with 50 Tesla wall connectors, charging at up to seven kilowatts per hour. The car park, with 122 spaces, has an hourly parking fee of HK$28 (US$3.59) for all vehicles, with no additional cost for EV charging. The move followed the opening of Tesla’s first supercharger station – which can can fully charge a Tesla in just 75 minutes – in Mid-Levels in July. Currently there are 92 Tesla superchargers at 21 supercharger stations, with more than 400 public and shared charging points. A Tesla spokeswoman said the company would continue to add charging stations in Hong Kong by seeking more partnerships with private developers, and more new site openings were planned for next year. “We’re proud to have Hong Kong as the site for one of the world’s biggest destination charging stations, as part of our long-term commitment to Hong Kong owners ... This underlines our continuous commitment to and investment in the Hong Kong market, as evident from these charging infrastructure additions,” the spokeswoman said. Such partnerships with private developers may boost Tesla’s sales, which suffered a severe blow after the government greatly reduced tax breaks on EVs for private use last April, from a previous full exemption. 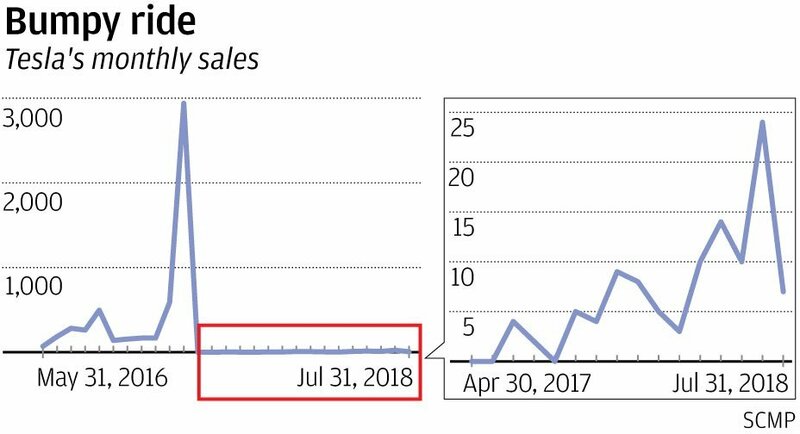 With the EV waiver for the first registration tax capped at HK$97,500 from April 1 last year, sales of electric cars nosedived. Only 136 new EVs were registered from April 2017 to March this year, compared with 5,819 in the same period the year before. Sales at Tesla, which employs 200 people in the city, were hit hardest. It sold just 40 cars from April last year to February this year. In March 2017 alone it sold 2,939. In March this year, the government introduced a one-for-one replacement scheme, for private buyers to enjoy another tax break of up to HK$250,000 if they scrap their fossil-fuel cars for an EV, as long as the first car is at least six years old. The applicant must have owned the vehicle for three consecutive years or more. The new tax break pushed EV sales up to 139 over the five months from March to July this year, with 65 Teslas sold in that time. The EV firm vowed to continue expanding its charging infrastructure in Hong Kong, no matter how the government changed EV incentives. FT Life Tower’s management said it was proud to be part of Tesla’s sustainability mission. “We’re excited to be part of the network and warmly welcome Tesla owners to our facility,” it said.